You can view your project plans - as well as any Fieldlens posts that have been pinned to them - from either the web or mobile. You’ll see posts as icons on your drawings -- and when you click into one you'll see the pictures, video, conversation and everything else associated with it. You can user filters to view only specific types of posts on the plan, look at the pinned posts in a list, or export reports directly from the drawing view. Tap into the Drawings Page from the bottom right of your project feed and navigate to the drawing you’re interested in. To zoom in and out, either double tap or use two fingers to pinch the drawing. By default, you’ll see the icons of project posts over your drawing - but you can hide them to view the drawing without icons by tapping Hide Posts in the bottom right corner. Want your pins back? Just click Show Posts. You’ll also see the status counts of the visible post at the bottom left of any drawing - showing the total number of unassigned, open, resolved, and closed posts. You can also look at just a subset of the posts by using filters. 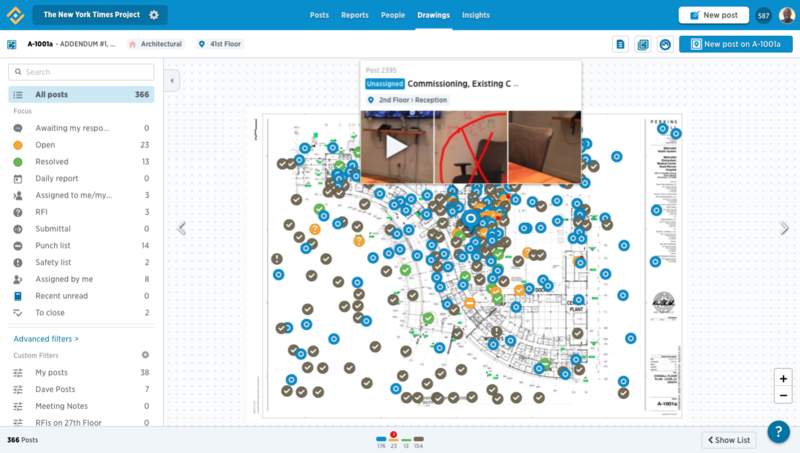 Click the drop down menu under the drawing name to use the quick filters (punch list or safety report, for example), or click the magnifying glass to the upper left of the plan for more search options. From here you can filter by post status, flags, locations, categories, assignee, and post dates - or search through your posts by typing in keywords and phrases. You can tap on any pin to see the post number, title and location at the bottom of the screen. Tap on that to bring you to the full post details, including photos, video, assignees and more. To return to the drawings, click the back arrow in the upper left. You can drop a pin and create a new post on any drawing. Just long press on your screen and drag the pin until it’s at your chosen location. Fill out your post details (including title, description, categories, and assignees) as usual and hit Post to save the pin. Access your drawings by clicking Drawings at the top of any project feed. Within the Drawings Page, you’ll be able to search and filter your drawings by location, discipline, and tags, sort by plan number and updated date, and switch between list and thumbnail view. Click on any drawing to view the full-size version. Double click, use your mouse scroll button, or click the plus and minus signs on the right of the screen to zoom in and out. The plan number, title, discipline, and location of each drawing can be found on the upper left of the screen - above the search menu. Similar to the mobile app, post stats will be at the bottom - breaking down the posts by status: unassigned, open, resolved, and closed. Overdue posts will be marked with a red circle. Each drawing will display any posts that have been pinned to it. You can click Show List to view summary information of all associated posts to the right of the drawing. Click a post summary from that list and the associated pin will be highlighted on the drawing. Click on the popup above the highlighted pin to view the full post details. You can also look for a post using the search and filter toolbar on the left. Search by post status, post flag, location, and assignee, for example, or search by keyword. You can add a new post - and drop a new pin - onto any drawing on the web app. Click on New post on X in the upper right of the page and move your pin to a specific location. If you need to move that pin, just click on a different location on the drawing. Tap Done to go the the New Post panel and add the additional details. To create the post and save the new pin, click Post on the bottom right. You can create a report based on the project posts associated with any drawing. By default, your report will be exported as a PDF with a Drawing Status layout - meaning the report will include all post details, media, and full-size drawings. Just as with any other report, you can change that format and customize the layout to your liking and have your report run on a recurring schedule. Click Create Report when done.